Are you a chocolate, lemon or vanilla lover looking for a healthy option to satisfy your craving? 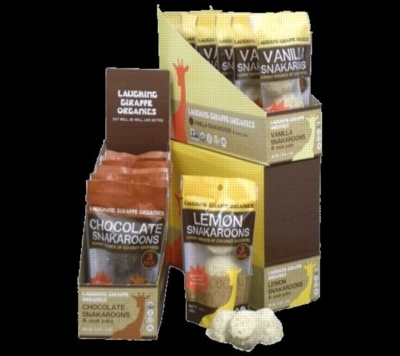 Look no further than this sweet snack on the go to satisfy your sweet tooth without sacrificing your health with the Snakaroons SnakPak by Laughing Giraffe Organics. Each snack includes unsweetened coconut combines with delicious ingredients such as mounds of cacao, almonds,coconut sugar, agave, vanilla extract, and Himalayan pink salt and more! Laughing Giraffe Organics offers quality, nutritional snack food made with only the purest organic ingredients. Their snacks are nutrient dense, gluten-free and minimally processed. Laughing Giraffe Organics is a family-run business that operates from San Francisco, CA. Choose from one sleeve or a three sleeve case. Each sleeve contains eight individual bags that are 1.25 ounce each containing three Snakaroons.